Ever make a pro/con list? I can’t say I ever have, or if I ever did, I don’t ever recall it helping me make a decision. It was suggested as a means for me to make a recent work related decision. However, if my only pro was “because I’m comfortable”, then really, it doesn’t count. Besides, my mind has been made up, I was just a little scared. For an engineer I make a lot of fly by the seat of my pants decisions. At least when it comes to my personal life anyway. Many of the biggest accomplishments of my life were born from rash decisions. Make the decision now and figure everything else out later seems to be my MO. Failure occurs when the figuring it out later part either becomes way too big for me to handle or never happens. At least then I know right? Leaping before looking, I got an MBA. I figured out the how (time, money and wits wise), but I am still figuring out the now what. That’s the engineer in me. Not one to do the detailed analysis prior to declaring the answer, but the one with the knack for problem solving after the fact. Now, when it comes to the men I don’t have in my life (but wish I did), I am the complete opposite. I will agonize for days, months or years (yes…years…) and will never ever act and take that leap of faith…I’m weird like that. So, putting my problem solving skills to work, I decided to randomly buy four green bell peppers at the farmers market. Now I had to figure something out. 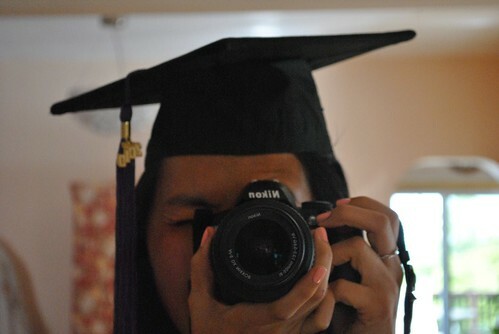 First, I thought about the big picture. What makes a stuffed pepper. Well, it is a pepper, hollowed out and stuffed with some sort of filling. The filling could be anything as long as the flavors all kinda sorta went together. I had some leftover pulled pork from my BBQ dinner the night before, so I decided to make a more tex-mex, southwestern type filling. 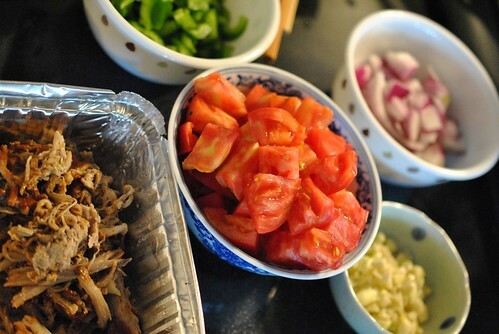 With the pulled pork, I could mix in some brown rice, onion, garlic, tomato and Mexican cheese blend. But what about the process? I don’t think i just chop some tops off and fill and bake. So, I referenced my handy America’s Test Kitchen Family Cookbook for some guidance. Put a pot of water (enough water to ensure the peppers will be covered in water later on, about 4 Quarts) on the stove, throw in some salt (about a tablespoon) and bring to a boil. Cut about 1/2 inch of the tops off and de-seed the four peppers. I just ran my knife around the tops (instead of chopping through), and pulled off the top pieces (not the stem) and diced them to put back into the filling. Using my hands I just grabbed the seeded center and de-seeded it that way. 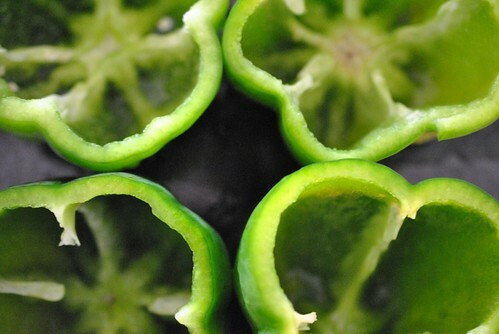 When the water comes to a boil, put the hollowed out peppers into the water and submerge them. Cook for about 3 minutes, or until they start to soften. 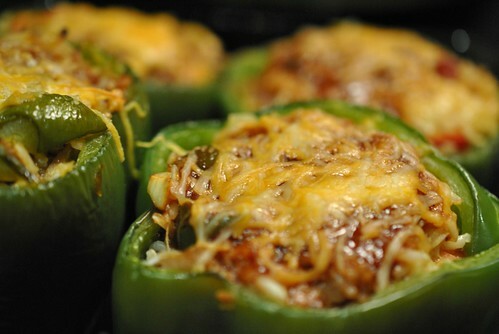 Then pull them out, draining all the water in the pepper back into the pot, and set them aside on a plate. Put 1 cup of washed brown rice into the water and cook for about 20 minutes (or until tender). Drain when done. Dice up the pepper pieces, onion (1/2 a red onion) and garlic (4 cloves…I really like garlic). Chop the tomato (1, and I had an heirloom on hand…seriously, my summer love this year). In a skillet with some olive oil on medium heat. Cook the onions first and cook until it starts to get tender. Add in the green pepper, then the pulled pork. When everything starts to look kind of done (pepper softening, pork heating through), throw in the garlic and cook another minute. Put this mix into a bowl and add in a couple handfuls of shredded Mexican Cheese Blend, the tomatoes and the rice. Mix it all up. Add in a little BBQ sauce for some extra flavor. 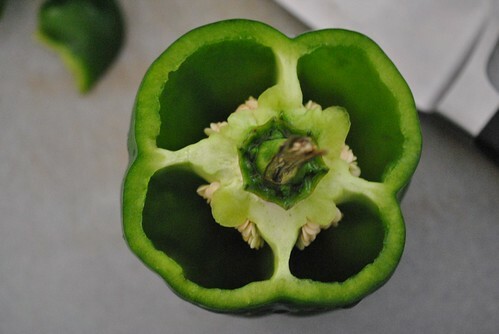 In a 8×8 pan, assemble the peppers cut side up and next to each other. Fill with the filling. 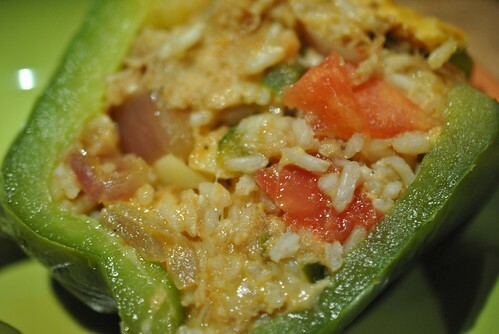 Mix some BBQ sauce with some water and spoon some over the filling in each pepper. Top with some additional cheese and put into a 350 degF oven for about 30 minutes. They are pretty tasty. Since there are four of them and one of me, I now have dinner for four days! It reheats very well in the microwave (1-1:30 minutes), and also goes great on top a bed of arugula. So very simple, and so adaptable to whatever you have on hand.